Taking a vacation somewhere you love can make you wonder what it would be like to own a vacation home there. It’s only natural to dream about having an easily accessible dwelling that you can tap whenever you want to come back to your favorite vacation spot, and owning a vacation home can in fact be a very rewarding and even lucrative experience — if you plan it well in advance and know what you’re doing. Of course, it’s difficult to know exactly what you’re doing if you’ve never bought a vacation home before. What do you need to consider before you take the plunge and decide to invest in a house that you’ll only be visiting part-time? Make sure you’re thinking about all of the factors on this list below and taking them into account, and your vacation home purchase will be a success that yields dividends both in memories and income for years to come. Many people decide they want a vacation home for a number of reasons, so you don’t need to figure out just one — but it is important to determine why you’re interested in purchasing a vacation home so that you can choose one that maximizes the benefits and minimizes the costs for you, personally. Do you want a guaranteed place to stay when you or your family goes on vacation to your favorite getaway area? Are you hoping to get a head start on a retirement home that’s perfect for you and your household? Is this a long-term investment strategy to help you build wealth? There are no wrong answers, but deciding what’s important to you will help ensure that your vacation home experience is a good one. Budgets are created for a reason, and that reason is to ensure that you don’t overextend yourself financially because you let your heart run away with your pocketbook. If you haven’t talked to a financial planner about whether you can afford a vacation home — and, specifically, how much vacation home you can afford — then find one you trust and sit down one-on-one to show them your assets and income, then get their opinion about how much you can spend on a monthly or annual basis. Even if you’re planning on renting out the vacation home to help cover the costs of ownership, this isn’t always a sure thing. Sometimes properties are vacant for weeks or months; sometimes there are emergencies that might require you to make some significant repairs (or pay for those repairs to be made). Life is full of surprises, not always pleasant ones, so you’ll want to be certain that your bottom line can handle the vacation home without causing a major financial disaster. Vacation homes have many of the same expenses as a traditional home, but you might not be considering that when you’re dreaming about buying one. In addition to the mortgage payment, the taxes, the homeowners’ insurance, and other loan-related expenses, you might also want to think about whether you need additional insurance on the property. Earthquake and flood insurance aren’t always required by a mortgage lender, but if your vacation home will be located in a geographic area that experiences those natural disasters with a fair amount of frequency, then it will probably be in your best interests to at least consider purchasing additional insurance policies. If you’re renting out the vacation home long-term, then maybe the tenant can take care of utility costs, and you can package HOA fees into the rent … but if you’re planning on turning it into a short-term rental on Airbnb so that you can come and visit at a moment’s notice, then you’ll also need to factor in the cost of electricity, gas, and water, and possibly also internet or even TV service, if that’s something you’ll want to enjoy while you’re there. It’s a lot better to overestimate your additional costs than to underestimate them so that you can be sure you’re including that money in your budget and aren’t encountering any surprises when it comes to finances. Many of us dream about buying that perfect plot of land and building a home to your exact specifications, and this can be one way to spend your money. But if you’re going to do it, it’s usually better to err on the side of making that built-to-order home your primary residence instead of a vacation home. As anyone who’s built a home soup-to-nuts can tell you, there’s a lot that can go wrong in the process, from contractors mysteriously becoming unavailable to permitting nightmares that hang you up for weeks or even months. That can be tough to handle even when you’re consistently available to help tackle those challenges; it’s quite logistically problematic when you live several hours or even states away and have to try to deal with everything remotely. Unless your real estate agent happens to have a great deal of expertise in the area where you want to buy, it’s usually better to find an agent local to the vacation location where you want to stake your claim. Those agents know the local market and inventory like the backs of their hands, and they can also help you find homes that will meet your specific needs, especially if they’ve worked with out-of-town buyers regularly. Additionally, local agents can be an incredible resource after the sale closes, whether you need a contractor to fix a leak or are seeking a property management company to help you with the minutiae of your investment. It’s wise to find one you can trust so that you can establish a long-term working relationship and really utilize their local knowledge to the fullest. When you’re planning to rent your home on Airbnb, there’s nothing more discouraging than realizing that local regulations forbid short-term rentals. Don’t lay this trap for yourself; spend plenty of time learning about the rules and regulations that exist where you’re buying your vacation home. Not every community is alike — that’s why we go on vacation! — and you want to make sure that your planned use of the property aligns with what you’re allowed to do. If you’re not sure where to start here, a local real estate agent can be a fantastic resource; they are typically a wealth of knowledge on local housing regulations and can help you navigate what you can and can’t do with your vacation home before you sink a down payment into the place. When most people think about a vacation home, they’re imagining a single-family unit — and if that’s what you’re absolutely sold on owning, more power to you. 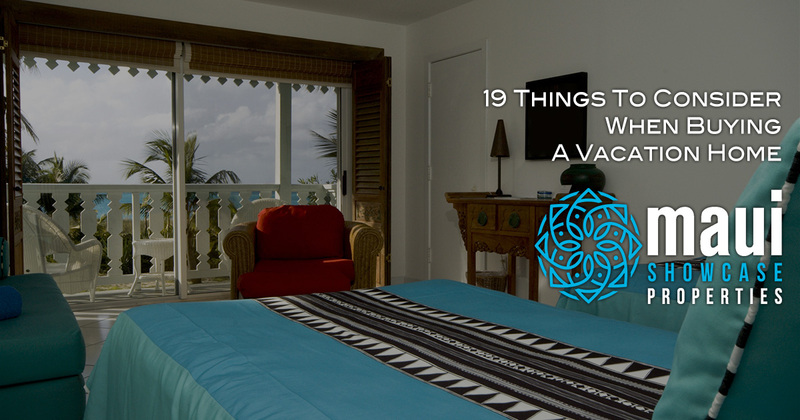 But before you decide on one option over another, it helps to be aware that there are multiple possibilities when it comes to purchasing a vacation home, and one might suit your purposes better than another. For example, maybe a condo would be just as useful for you and your vacation-home plan as a single-family home; yes, there are usually HOA fees involved, but on the flip side, you won’t need to spend money on keeping up with the landscaping, and many condos have amenities that single-family homes don’t offer, such as an onsite gym or private pool. If you have the ability to buy a multifamily property, it might make an even better arrangement for you than a single-family home; you’ll have more units to rent either long-term or short-term, and you can always leave one open for your own use without impacting your investment bottom line nearly as much. If you’re not sure what would work best for your needs, talk to your local real estate agent about your options. A timeshare might seem like a dream investment, but if you think about how much you’re really spending for just a few days a year in your vacation area of choice, it might not break down to a good strategy for you. After all, there’s a reason why most timeshare sales involve an incentive to sit down and listen to the sales pitch. Between blackout dates, the advance booking, upfront costs, annual fees, and other factors, if you really want to own a vacation property, it’s usually better to go all-in and buy one yourself than putting your money into a timeshare. It’s easy to imagine that you’d spend all your long weekends and paid time off at your vacation home, and maybe that’s really the case! But it’s best to make a plan for how often you’d be visiting your vacation home and when so that you can truly understand whether it’s a good deal for you … or a sour one. If the slow time at work comes during the rainy season at your vacation home, then you might want to consider an alternate location or figure out how you can take some time during peak season. On the other hand, if you plan on spending all of the peak season at your vacation home, be aware that this decision is going to affect how much money you can make from the home as a short-term or monthly rental when you aren’t there. Talk to the other members of your household or your family to come up with a realistic estimate of how much time you’d spend at your vacation home and whether anyone else would be interested in using it when you’re not around so that you can make a solid plan for how you’ll be managing the property. Some vacation home-buyers who are hoping to create ongoing wealth and build a legacy might purchase a vacation home thinking that the real estate market is going to continue to go up … and up … and up, no matter what. But the reality is that real estate markets, like most economic markets, are cyclical in nature, and no market grows consistently and continually forever without eventually plateauing or even declining. If your long-term wealth strategy is to invest in a home that will appreciate in value by double digits every year before selling it in five years, think again — you can’t predict the future, and you don’t want to wind up holding an empty bag because you counted on something that was much less than guaranteed. By that same token, shopping for a vacation home during the “down” months of the market might mean there’s less inventory to pick from, but you’ll find better deals. Whatever your strategy, do your best to be realistic about the market and not count on increasing returns indefinitely; that’s a bad strategy. Perhaps the main attraction of this vacation area is its local body of water — whether that’s an ocean, river, or lakefront. If that’s the case, is it really a good idea to buy a house that’s miles and miles away from the water, even if it’s a great deal? The old adage “location, location, location” applies equally to vacation homes as to your primary residence, and you don’t want to sacrifice your vacation home dreams on the altar of location. Some vacation locations are more forgiving than others in terms of prime location, all that said, so if you can talk to a local agent about the best places to buy (and what fits with your budget), they might be the best source of advice on which locations will work and which ones really won’t. Not every vacation area is popular year-round; sometimes it gets too hot in the summertime, sometimes too cold in the winter. Seasonality is hugely important for people who live in vacation locations, and as a potential homeowner in one of those spots, it will become hugely important for you, too — especially when it comes to tasks like winterizing your home, and also if you’re planning on renting the home out to vacation-goers in order to make yourself some ongoing money from the property. You might have to reduce the price during the off-season or even resign yourself to the fact that you just aren’t going to see any renters at all. If you haven’t visited the community where you want to buy a vacation rental in all four seasons, make a point to do so, which will help you understand the opportunities and challenges that exist for a homeowner. Your local real estate agent can also be a great resource for information about how to work with the seasons instead of against them. Sure, the thought of owning a beach home overseas is enticing, but especially if this is your first vacation home, it might be a bigger risk than you’re imagining. Buying a home in a different country is incredibly complicated to begin with, and depending on which country you’re targeting, there could also be potential political upheaval or regulatory changes that you’re not anticipating or are perhaps completely unaware of — and that can really come back to bite you in a big way. If you do think that buying a home overseas is worth it, make sure you’re discussing all the pros and cons with a local agent, and getting a second opinion is probably worth the time it will take, especially if you can track down another U.S. citizen who owns a vacation home in the area. It’s always nice to think about how a vacation home strategy with your entire family might work out — perhaps you have siblings who also love the area and might be willing to go in on a vacation home, or perhaps your parents or adult children would be good candidates for sharing the financial burden of a vacation home. If this is part of your plan, proceed with extreme caution. When you aren’t all on the same page about how often the home will be open for family use instead of rented out, whether family friends can use it (and how often, and for how much compensation, if any), what the split in equity will be when you sell it, and how it will be maintained, problems arise, and family rifts have taken place over much less money than the tens of thousands (or hundreds of thousands) of dollars you could be out if things go sour. Depending on your vacation location, there may be natural disasters or even regular run-of-the-mill home disasters that you aren’t considering during the purchase process, and you’ll definitely want to make some plans just in case. What happens if there’s an earthquake or a hurricane and it hits your home? Are you prepared financially or otherwise? And what if the roof caves in or the foundation starts to leak — do you have a notification system (via a property manager, renter, or friendly neighbor who routinely checks your house) that can inform you of what’s happening in a timely manner, in addition to a budget for fixing any issues? As most of us know, Murphy’s Law states that anything that can go wrong, will go wrong, so if you plan for everything that can go wrong, at the very least you’ll have some peace of mind about how safe your vacation home is — and at best, you’ll be able to leap into action if the worst really does take place. Even if you don’t plan to rent your vacation home at all and finances aren’t a factor, there are always risks involved with leaving a home unoccupied for long stretches of time. Pipes could burst, pests could move in, or you could be burglarized by people who know the home is empty and think they can find a better use for your television or even your copper wiring. And if you are renting the home and plan on using the money you get in rent to pay off the mortgage on the house, what will you do if the current long-term tenants leave or if you have a gap of several weeks or months when short-term tenants are in scarce supply? Talk to the local real estate experts about what you can expect in terms of occupation and vacancy, then make a plan for how to handle it. Maybe that plan involves a property management firm, or maybe your real estate agent lives close enough to do a pop-by every couple of weeks to make sure things are still running well. Whatever the case, having the plan in place will give you greater peace of mind and help you understand what went wrong in case a vacancy does lead to a worst-case scenario. Retiring in your vacation home once your working days are through might be a nice thought that comforts you when you’re stuck under the fluorescent lights in your cubicle at the office, but before you let your imagination run away with you, think about the implications of this plan. For example, if you’ve got a medical condition that’s going to require more attention with age, then buying a vacation home that’s hundreds of miles from the closest specialist is going to be a brand-new problem to face once retirement rolls around. Or if your joints are already causing problems when you try to climb stairs, don’t assume that’s going to go away when you retire and that your three-story vacation home is a good idea. Understanding what your future holds and planning around it is just common sense, so make sure you apply that understanding to your vacation home, too. There’s always a certain amount of fantasy involved in purchasing a vacation home, so do your best to rein yourself in and bring reality back when it’s important. Realism is critical when you’re making a budget for your vacation home as well as many other decisions you’re going to be making — how much time you’ll spend enjoying the vacation home, how to plan for emergencies and vacancies, how much money you’ll make from renting the home, and so on. You also need to be realistic about any partnerships you’re considering for the vacation home; maybe your brother really wants to team up and buy a place, but if you know he’s terrible with money, then you probably don’t want to go there. Being realistic now will lead to a better experience later on. Even though a budget is critical when it comes to purchasing a vacation home, sometimes we need a little reminder that this decision might not be all about finances and return. Will you be making some lifelong family memories at this location? Are you planning to go back again and again whether or not you own a home there? How will it make your life better in small and intangible ways in addition to the obvious ones, like lining your pocket with a little extra cash? Consider all of the pros (and cons) to owning your vacation home, and don’t leave out factors like convenience and the joy you’ll reap from sitting on the porch watching the sun set. When you’re seriously thinking about buying a vacation home, you’ll need to take a comprehensive look at what it would mean for your budget, your life experience, and much more. If you can consider everything on this list and understand what you’re getting into, the odds that you’ll have an enjoyable, rich experience are much higher — and you can start shopping with confidence.